The Sri Lanka Police said Friday that it has requested the Eelam People's Democratic Party (EPDP), a major coalition partner of the People's Alliance government, not to go about in the Jaffna peninsula with weapons during the 2001 general elections. 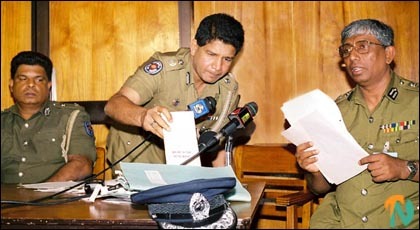 Addressing a press conference at the Police Headquarters in Colombo Friday the Deputy Inspector General of Police for elections, Mr. Gamini Navaratna, said that maintaining law and order in Jaffna during the elections would be easier for the Police if the EPDP desists from carrying weapons in the northern peninsula. Political parties contesting the elections in Jaffna complain that the EPDP has many weapons in its possession and is bent on rigging and intimidation during the elections. More than nine hundred elections related incidents including three killings have been reported to the Police so far, DIG Navaratna told journalists. He said that the Police have asked the Ministry of Defence to release five thousand troops to replace Police personnel who are will be pulled out from the Colombo and its suburbs for election duty. More than fifty thousand Police personnel would be deployed for the elections, the DIG (Elections) said. Mr. Navaratna said there were reports that the EPDP was going about with weapons in Jaffna. Meanwhile, armed members of the EPDP removed the hoardings, posters and banners put up by the Tamil National Alliance and the United National Party in Jaffna town Friday afternoon. "The army and Police are not doing anything to stop the EPDP. If posters and banners have to be removed then it is the responsibility of the Police", said Mr. T. Maheswaran, the UNP's chief candidate for Jaffna. He said that he has complained to the Jaffna security forces commander and the DIG (northern range) that a well armed Tamil para-military group close to the ruling PA are roaming Jaffna in vehicles without licence plates, posing a threat to the lives of his candidates and that the group is planning to throw acid at them.